Herculaneum V.22. Stairs to dwelling on upper floor, above V.21. According to Guidobaldi, “On the upper floor of V.21-22, was found the archive of wax tablets belonging to L. Cominius Primus”. “the dwelling quarter of the upper floor (which is reached by the entrance at no.22) is comfortable and preserves a plain decoration; one of the rooms, divided from the others by a framework and used as a bedroom, was lighted by a square window, which still preserved a part of its wooden folding-doors”. Note: this description may apply to the upper room of V.19, as from our photos there does not seem to be much of an upper floor remaining above V.21 and V.22. In our photos for V.21, there does appear to be a door remaining on the upper floor connecting a room above the west wall of V.21, into the upper area of V.20, and then through doors in a framework into V.19. 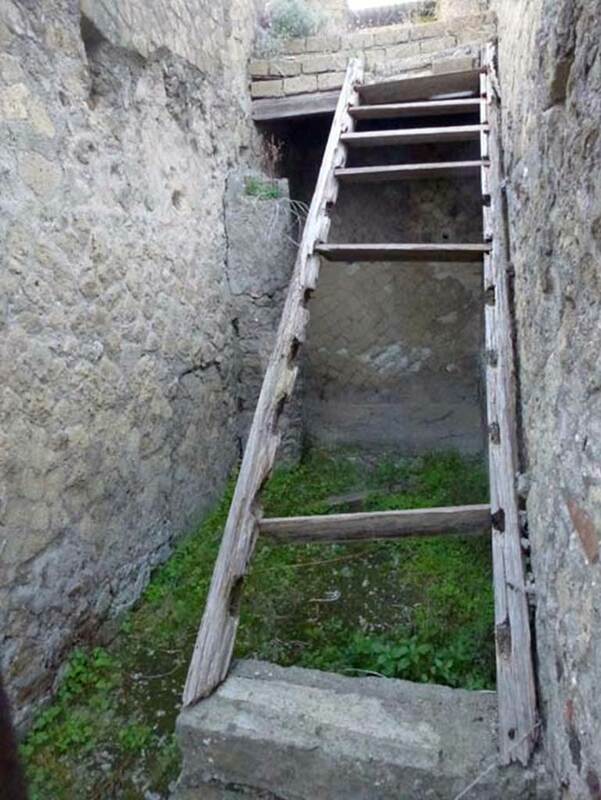 According to Camardo and Notomista, a photo shows a modern metal barrier which was put in place to allow access from these stairs to the upper floor (and across to the room with the outline of the cross). They write - “The case of the so-called "room of the Cross" of the House of the Bicentenary, with the creation of a new wooden staircase at number 22 was to allow access to the first floor”. 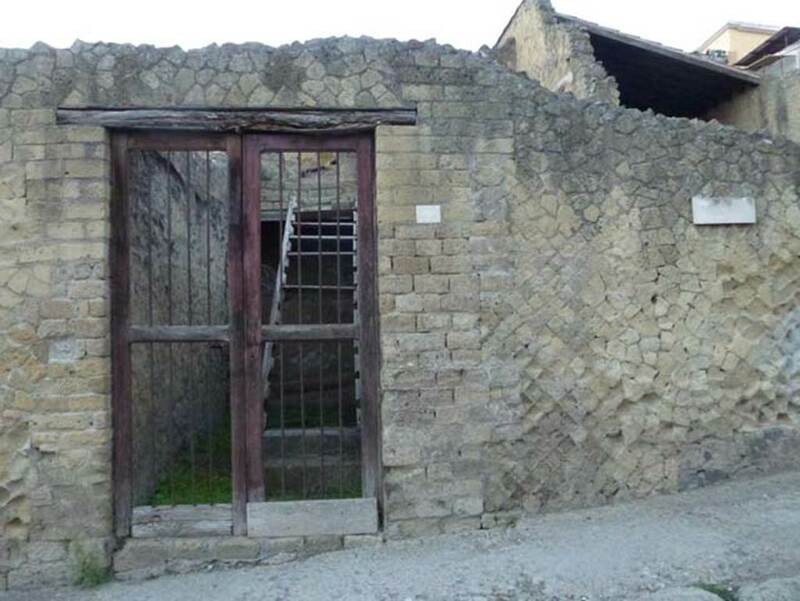 With a note 152, that says- “The possibility of access to the dwelling placed above the shops at V. 20-21 was probably put in place with the discovery inside one of the rooms, of a carbonized bed, which for some years was left in situ”. 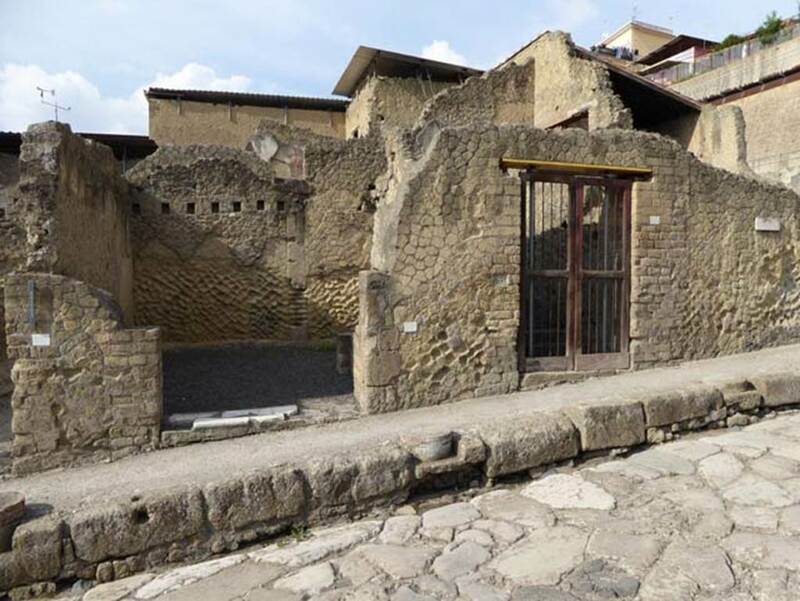 V.22, on right, Herculaneum, October 2014. Entrance doorways on west side of Cardo V Superiore. On the left is the entrance doorway to shop at V.23. Photo courtesy of Michael Binns. V.22, Herculaneum. October 2012. Looking west to entrance doorway. Photo courtesy of Michael Binns. V.22, Herculaneum. October 2012. Remains of reconstructed steps leading to upper floor.